As well as being a close and interesting tussle for the championship, this year is producing some of the strangest events I have ever witnessed in F1. Most of them involve Ferrari, in one way or another, but it is also the first time I have heard of a team manager assaulting one of his drivers. In comparison, the spat between the McLaren drivers was minor indeed. When it comes to Ferrari, however, it seems that the list of unusual events goes on and on. It started with Nigel Stepney explaining to Autosport magazine just how dissatisfied he was at Maranello; normally, disaffected Ferrari employees do not go around advertising the fact. And then that suddenly blew up into odd stories of raids on homes, trips to the Far East to get away from it all and a court investigation started in Italy. When the scene shifted to England and another raid, this time on the home of Mike Coughlan, with suspicions of industrial espionage and whistles blown by copy shop employees, it began to look stranger than fiction. The Ferrari documents affair has been the big story of the year, of course, but there are other things happening that do not quite add up. The variable performance of the Ferrari cars can be explained by its reaction to different tracks, but the growing catalog of errors, such as stalling on the grid and sending a car off without refueling, looks completely out of character for a team that had become legendary for its smooth functioning. Naturally, we think of Michael Schumacher and Ross Brawn and nod wisely as we guess that Ferrari is missing their input. Yet the position of Michael is perhaps strangest of all. He seems largely at a loose end, turning up for races when he feels like it and then hanging around like a spare wheel. Even he has admitted that he is still not quite sure of what he should be doing. One assumes that the team kept him on in a fluid position because they wanted his influence to continue but did not quite know how to define a role for him. We are told that he still advises Massa on strategy but that seems on a very intermittent basis. And now he has decided not to attend any more GPs this season. Could it be that it is not so much that Ferrari felt the need to continue with Michael's input to the team, but rather that they wanted to prevent his going elsewhere? That is mentioned often enough as the reason why Stepney was not granted a sabbatical - why should it not be true of Michael too? Whatever the truth, it leaves Michael in a very odd position indeed, being counted as a team member yet without a definite role or job description. When we add him to the list of unusual developments at Ferrari, it looks very much as if the team has passed overnight from machinelike efficiency to muddling through. It is hard to see them maintaining development of this year's car with all this going on and yet, so far, they seem to be doing so. Much is made of the fact that their drivers get along together a bit better than the McLaren duo has of late, but that may have something to do with only one or other of them being in contention at each race. Even that is abnormal for the Ferrari we have become used to for the last ten years. It seems to me that we are watching a team in transition and that the creature that emerges at the end of the process may be very different from what we expect. Whatever the result of the pending court cases, the whole affair is more unsettling to Ferrari than it is to McLaren and I shall be very surprised if they manage to achieve either of the championships at the end of the season. The old saying is true: nothing lasts forever. Schumacher does look a bit of a lost soul at the moment. At the end of last season I don't think anyone expected to see him at races this year, yet he surprised them by turning up at quite a few - but noone really knew why he was there, and Ferrari haven't been forthcoming with an expanation either which is weird. I was lucky enough to be invited to the Red Bull factory recently and our guide who was showing us around the factories which are currently being renovated said that as hard as they try, any disruption back at base does affect the racing team. So if a little building work and upheaval can affect performance ontrack then I can't begin to imagine what damage Pitlanegate is doing to McLaren and what affect the whole Stepney/Coughlan affair is having on both McLaren and Ferrari. The sooner it's all cleared up the better and we can get back to racing, but I suspect this is going to run and run. At least Schumacher can say that he affected F1 more than any previous driver - I think we're going through a sort of post-Schumacher period of adjustment while the drivers and teams re-learn a sport that has changed now that he has gone. And he really has gone - he said recently that his knowledge and understanding of the cars is already out of date. There's only one thing i can say about this article. Even som may don't want to admit it, Michael is the one who has made the Ferrari Team look so good all the time. With his work-ethics and discipline he have more or less forced the team to be at the top of it's performance all the time. And that is only natural. Because having a person as driven as Michael in a team, automatically makes you want to do your best. But then, when he goes away, everybody feels lost, because there's no one telling everybody what to do or where to be, or even where the whole thing is going. There's no way Massa or Raikkonen is as disciplined of track that Scumi was. The only one i can imagine coming even close to it is Lewis Hamilton. And that is because he don't know of anything else. He have been driving cars and racing since before he could stand up and walk. 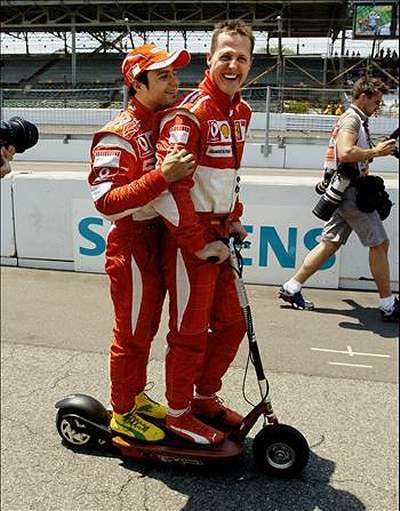 And he is more competitive than even his teammate Alonso. It is going to take Ferrari this season, and maybe the next to adjust, but then there's going to be some order and reason in the team again. And they can go back to winning championchips again. And hopefully Raikkonen can get to means with his luck always abandoning him when he needs it the most. I think everyone accepts that it was Michael who made all the difference to Ferrari over the last decade or so, Björn. Whatever we may think of his driving skills, the fact is that he insisted on 100% effort from everyone in the team and he got it. All credit to him.